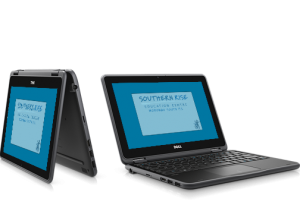 At the start of 2012 Wodonga South Primary School introduced an optional 1 to 1 Laptop program for all year 5 & 6 students. With an annual average of 70% of the student’s parents taking this opportunity up, the school is able to assist in providing anytime, anywhere access to information and learning. The use of the laptops in the classroom is constantly evolving as students and teachers become more familiar with the new digital tools. With greater access to real-time information, digital learning resources, educational software and collaborative workspaces, students experience higher levels of motivation and engagement in their learning. The use of the laptops enable the students to improve in areas such as organisational and technological skills, revision, writing and editing work. With the development of presentations and other multimedia projects, students experience subsequent improvement in analytical, presentation and speaking skills. 1-to-1 programs are an element in an international move towards individualising learning, which can increase independence and self-initiated learning in students, and extend their learning beyond the classroom. Students who have their own laptop computers have been found to take greater pride and ownership over the knowledge they create, with a flow-on to more flexible forms of schooling. 1-to-1 programs can extend formal learning communities to include parents, siblings and other people important in students’ lives. Also, the programs may lead to initiating global communication and collaboration and develop creative expression. Students that do not opt into this program are supported in their learning through the use of the extensive amount of laptops that the school provides for all students at Wodonga South Primary School. The Digital Technologies provided by the school complement the school curriculum by providing digital learning tools that link in with planned classroom activities. The learning is supported in the classroom by using software programs, referring to resources that have been downloaded, interacting with the Interactive Touch Screens throughout the learning areas or working with audio, picture and video files that have been saved.